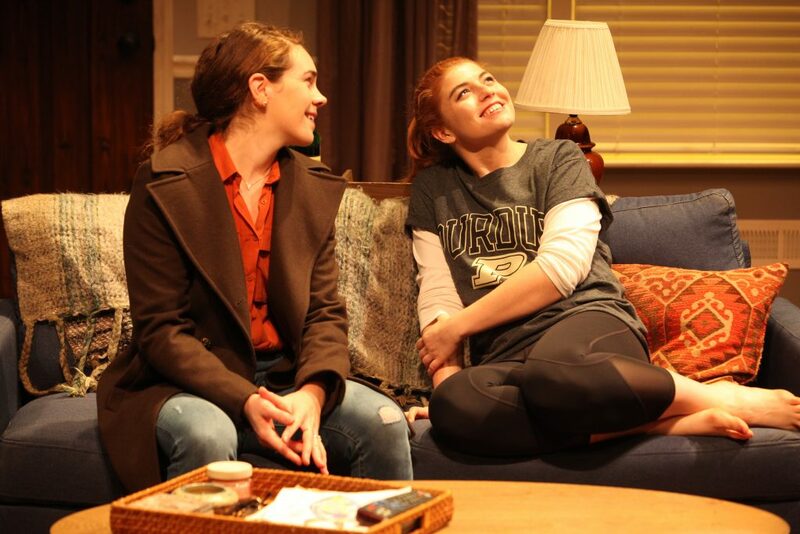 “The Resting Place” Exposes Horrifying Family Secrets, at Magic Theatre, S.F. “The Resting Place” hit me in my gut. 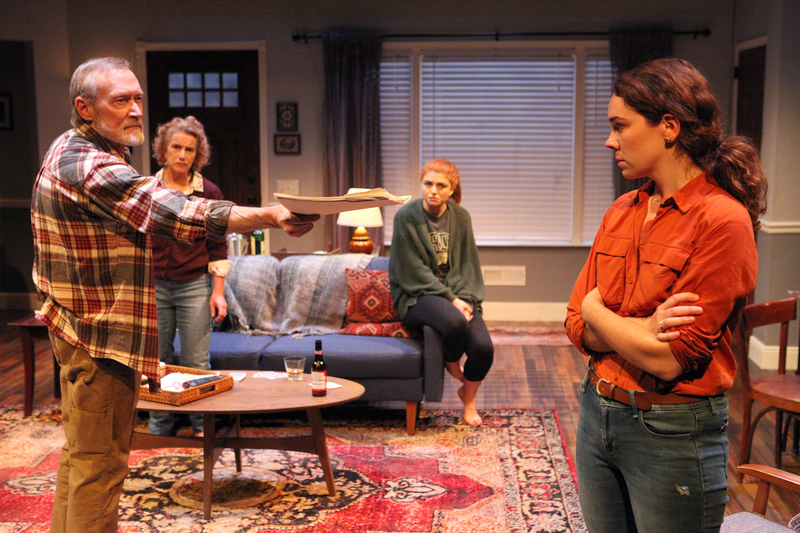 A family is brought together by tragedy, in the aftermath of a sudden suicide. We are thrust into the lives of two very headstrong sisters, take-no-prisoners Macy (stern Emily Radosevich) and self-righteous Annie (skillful Martha Brigham). They are forced to pick up the pieces after they discover that their late brother Travis committed a horrible act. Although “The Resting Place” is not easy to swallow, it offers moments of cheer peppered with agonizing revelations. James Carpenter and Emilie Talbot, as father Mitch and mother Angela, capture parental suffering flawlessly. Angela becomes a modern day Madonna and jester, offering comic relief with her drunken antics. When she proudly proclaims that her husband is taking Viagra, we laugh until we realize it’s all part of her frustration. 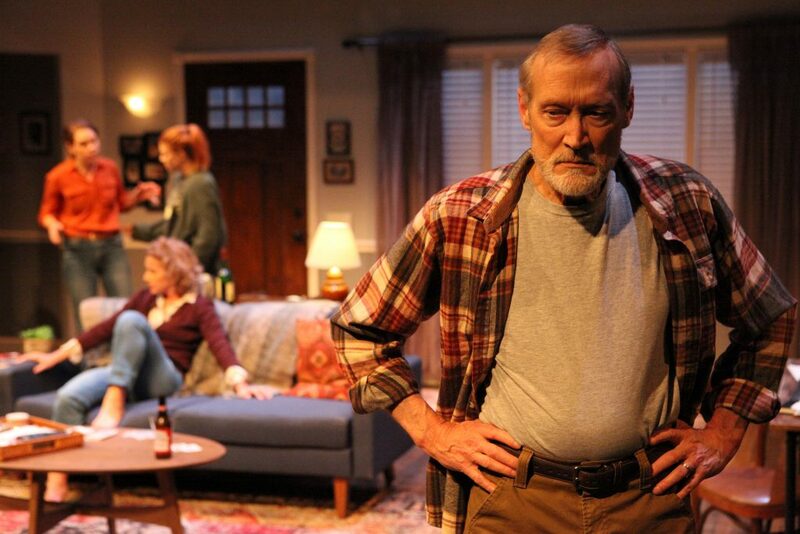 Playwright Ashlin Halfnight shows the sisters and parents struggling to maintain their love for their departed brother and son. Even though we never see Travis, we come to hate him. We see his victims in the form of timid Charles (charming Andrew Lebuhn). Charles tells us in shocking detail, what happened in dark rooms at summer camp. Travis’ former lover Liam (bold Wiley Naman Strasser) speaks fondly of time spent with Travis, but admits Travis was infected with a terrible sickness. “The Resting Place” reminds me of documentaries and TED talks where parents speak out about a son who has committed a school shooting. How could they not know? Was there something they could have done? Halfnight creates empathy by allowing us to see Travis as a family member, rather than a monster–playing on our pity and anger. A simple image is seared into my mind: the father, Mitch, slowly rolls up a red carpet and carries it out, as the stage undergoes a strange earthquake. Not a single dry eye in the house, though we know Travis did unspeakable actions to those who were most vulnerable. Though Travis is a monster, we see his humanity through his family’s love for him. It’s not an argument about whether he’s guilty or not. Can we forgive those who stay behind to carry the blame? “The Resting Place” is intoxicating and powerful, I could not look away. Ashlin Halfnight leaves us questioning our ability to unconditionally love one another. Cast: James Carpenter, Emilie Talbot, Martha Brigham, Emily Radosevich, Wiley Naman Strasser, and Andrew Lebuhn.